In addition, say the authors, if kids watch TV too close to bedtime, their minds may remain stimulated just enough to keep them awake and miss out on precious hours of sleep. Cutting short a good night's slumber, past research suggests, can lead to weight gain and hypertension, since the body's metabolism doesn't have enough opportunity to recharge and renew itself overnight. To those reasons, Ludwig adds a few others. 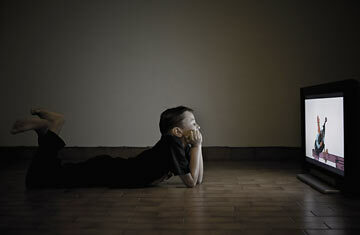 Previous studies have found that watching television lulls people, especially young children, into a low-energy state that is akin to sleeping  that's about as sedentary as a person can get. "Some studies suggest that the metabolic rate can fall even below that of sleeping," he says. "They suggest that children are getting into some deep hypnotic state at times." Worse yet is the content of television programming, which Ludwig suggests may have long-lasting repercussions. "There is the possibility that the greatest long-term impact of TV viewing is on children's eating habits through food commercials," he says. Some experts estimate that youngsters are bombarded with 10,000 food commercials each year during children's programming, and most of them aren't promoting salads or fruit. All this marketing, says Ludwig, changes children's taste preferences and causes them to crave  and beg for  unhealthy foods. "Children are seeing these commercials at an age when they are just establishing eating habits that can become ingrained and last a lifetime," he says. Eisenmann stresses that while the new study found an association between TV-viewing and higher blood-pressure readings, it did not measure whether children developed hypertension. However, in previous studies involving the same group of children, whom he and the other scientists have been studying for four years, about 20% of the children had developed prehypertension or hypertension  often because of weight gain. Although the study did not follow the children over time, the findings still suggest that TV-viewing has a strong influence on the health of young children. Environmental and lifestyle factors, like diet and inactivity, account for about 70% of a person's blood pressure (genes determine the rest), and high blood pressure at a young age may increase kids' risk of developing heart disease in adulthood. "There is no fundamental biological need for TV-viewing in childhood," says Ludwig. "So these findings certainly warrant follow-up."